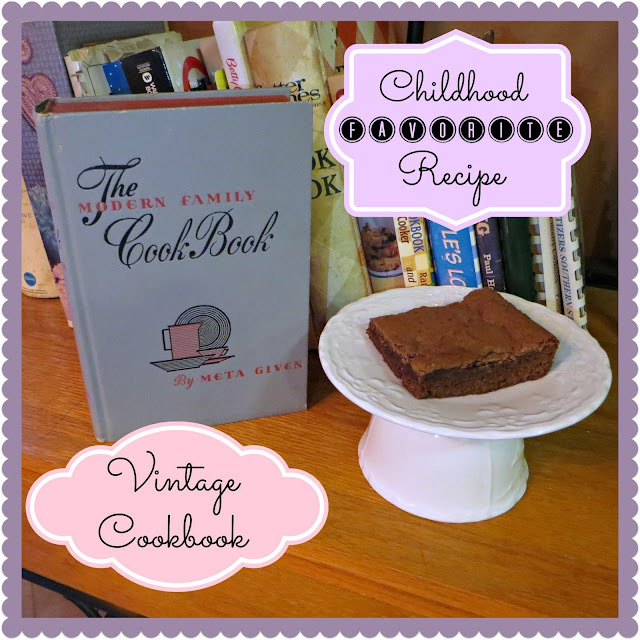 I have many, many wonderful childhood memories of baking brownies using The Modern Family Cookbook by Meta Givens. My Mom got the book from a coupon in an oatmeal box sometime after she and Dad were married in 1961. I can never remember a time without it. 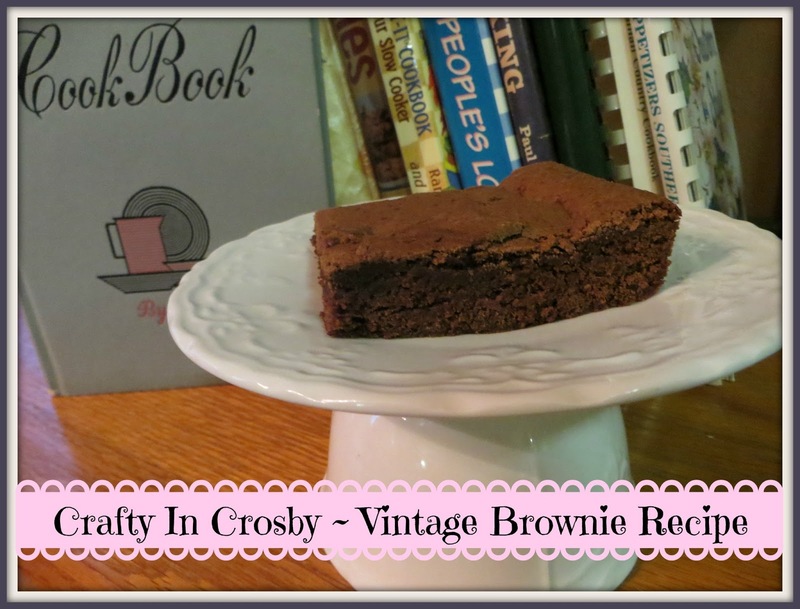 In fact, I blame my love of brownies on this cookbook! This was our go to recipe when I was a kid with only one substitution - the recipe calls for 2 squares of baking chocolate and Mom substituted 1/3 cup of cocoa and 2 tblsps of margarine for the chocolate. Sift flour, measure and resift with salt. Cream butter, gradually blend in sugar and add beaten eggs; beat until smooth and fluffy. Add vanilla and stir in melted chocolate. Add flour mixture alternately in 2 or 3 portions, stirring well after each addition. Add nuts with last few stirs. Spread in an 8-inch square cake pan which has been buttered and bake in a moderate oven (350° F.) for 20 minutes. Remove pan to cake rack. Cut in pieces while still warm. Makes 16 to 20 brownies 1 x 2 inches. Ok, really? In what world does an 8 x 8 pan make 16 brownies???? Not in our world, that's for sure. If I'm feeling especially magnanimous I can sometimes get 9 out of the pan, but usually I'm too greedy and their are only 6 !!! Nuts - I don't like nuts in my brownies, so we rarely put nuts in them as a kid. I still feel that the perfect brownie shouldn't be interrupted by a crunchy nut! Substitution - 1/4 of a cup of cocoa and 2 tbsps of margarine can be substituted for the 2 squares of baking chocolate. I actually used both the cocoa and the 2 squares of chocolate in this recipe and they came out really yummy! Mom's copy of the cookbook was copyrighted in 1961. She said that she also bought copies for both my Grandma's too. I was lucky enough to find a pristine copy of the same cookbook in an antique store in Atlanta in 2002 or so. Mine was printed in 1958 and belonged to A. A. Moore. She wrote her name in it along with the date 9/10/58. This cookbook is actually older than I am - can you believe it? This is a really easy to make recipe that I always seem to have the ingredients for and cooking these brings back some wonderful childhood memories. How about you? Do you have memories of cooking with your Mom or Grandma? Just looking at this cookbook brings a rush of warm loving memories to mind. In our family, you showed your love with food and boy was I loved!! Wishing you all lots of lovely memories! Hi Jeanette, this recipe sounds so good and easy too. Thanks for sharing it. Have a great weekend. Thanks Julie! It has stood the test of time! We do the same recipe...so yummy! And easy too!!! Thanks for stopping by! You should ask her if she remembers this cookbook? Thanks for dropping by - enjoy the rest of your weekend! I absolutely LOVE vintage cookbooks and recipes! Visiting from Marvelous Mondays and thanks so much for sharing this. Have a wonderful week!